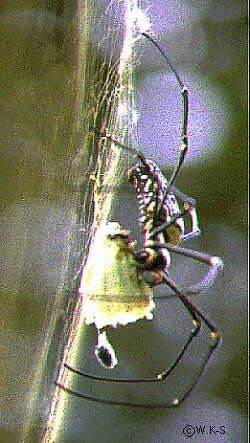 The body of these spiders has a length of 4 to 5 cm. We found plenty of them in the region of Müang Sing, North Laos. The butterfly has no chance. Sometimes the spiders too have no chance. People told us, that they taste good, when they are roasted. 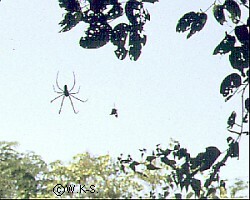 "The spider is a Nephila spec., they are everywhere in SE-Asia."